The ever-increasing use of FIBCs across a multitude of industries brings with it the growing need at the product source, for the supply of equipment to accurately fill the bags, whilst minimising wastage and dust. 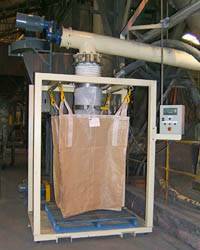 The filling of FIBCs with bulk materials can be accomplished using several different weighing systems, each employing either a conventional platform scale or an overhead load cell system. Each method has its own advantages and disadvantages and should be selected based on particular site requirements. The design should also cover all the OH&S issues relating to placing the empty FIBC, removing the full FIBC and how the operator accesses the filling station. Melbourne based Total Engineering Systems Pty Ltd (TES), are specialists in dynamic weighing and with experience across a broad range of industries including Fertiliser, Food, Plastics, Grains, Quarries, Mining, Chemical and Recycling. They can offer a suitable solution to most FIBC filling applications. TES has many satisfied customers around Australia. One such customer is Unimin Australia Limited, a large diversified processor and supplier of raw materials for the Australian, New Zealand and Asian manufacturing and primary industries. The principal industries they supply are glass, ceramics, paint, plastics, rubber, building materials, paper, refractories, oil drilling, foundries and coal washing. As such, the company relies heavily on the distribution of its products in FIBCs. The Unimin plant at Sandgate NSW had been using an FIBC Filling system for its Clay and Manganese products for many years. These products are very fine (150 micron) and, due to the nature of the products, the system in use was very slow and the dust created was causing the company both environmental and operator health and safety issues. In an effort to solve these problems, Unimin approached TES for a solution. TES designed a system specifically to suit the requirements of Unimin. This custom designed system, not only provided a fast and efficient FIBC Filling System, but also gave Unimin the ability to pneumatically convey the product from the FIBC filling head, to their bulk storage silos when required. This was achieved by the use of a mobile rotary valve and in feed hopper arrangement being adapted to be positioned at the fill head and accept product from the feed screw. A pneumatic conveying line is then connected to the system, enabling the product to be delivered to the silos. Regardless of the industry, it is the principals adopted by TES that ensure the equipment supplied is suitable for each individual application. This starts right at the beginning of the process with the Selection Criteria. Total Engineering Systems are always flexible with their designs and they will modify standard products or, as with the system at Unimin Australia, they will engineer and design equipment and systems to suit specific applications, material properties and site dimensional constraints.